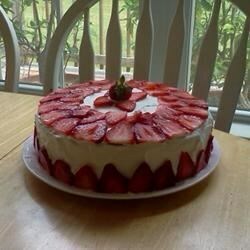 "An incredibly moist and light cake made with cake mix, strawberry gelatin and fresh strawberries. Great for summer picnics and get-togethers. Can be made to be very low fat by using an egg substitute and applesauce instead of oil in the cake mix and using fat free topping." Prepare cake according to package directions. Bake as directed for a 9x13 inch pan. Allow to cool. Prepare the strawberry gelatin according to package instructions, using the 4 cups of water. Pour over cooled cake while still in liquid form; the cake will absorb it. Chill in refrigerator for 2 hours, or until gelatin is set. Spread whipped topping over cake and top with sliced strawberries. Perfect light summer cake! Another tip: 4 cups of water is for 6 oz of gelatin. Recipe calls for 3 OZ!! Therefore, you only need 2 cups of water. Definitely will make again... thanx! I used 2 9" round cake pans. I used 2 cups boiling water to gelatin. I added 3/4 of a bar cream cheese. I also used @ 1/3 cup powdered sugar to topping mixture. Family loved it. tks.